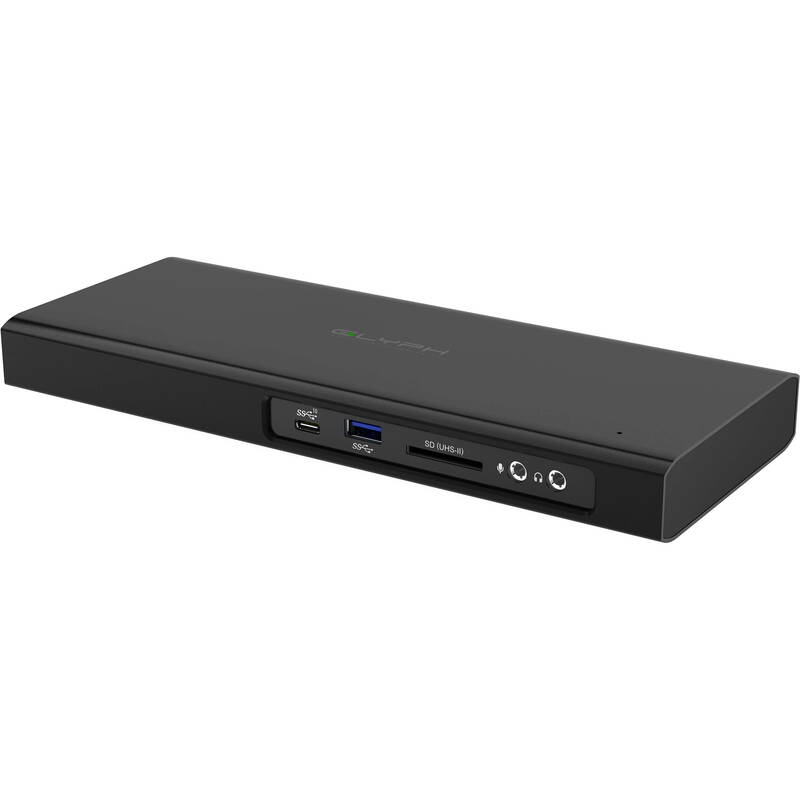 Whether you're looking to simplify your workstation setup or streamline your DIT cat, the Thunderbolt 3 Dock from Glyph provides a wide range of ports, plus a 500GB NVMe PCIe M.2 SSD that delivers transfer speeds of up to 1500 MB/s. The SSD is preformatted HFS+ with Journaling for Mac OS 10.X and above. It can also be used with Windows 10 and later via a simple reformat. Glyph built this dock with two 40 Gb/s Thunderbolt 3 ports. One of these ports can be used to connect a single peripheral or daisy-chain up to five additional devices, while the other is used to interface with your host system and provides up to 87W of power for device charging. Other integrated ports include one 10 Gb/s USB 3.1 Gen 2 Type-C port with 5V / 3A of power, two 5 Gb/s USB 3.1 Gen 1 Type-A ports with 5V / 1.2A of power, one DisplayPort 1.2 port, a Gigabit Ethernet port, a UHS-II SD card reader with speeds of up to 270 MB/s, a 3.5mm headphone jack, and a 3.5mm microphone jack. This dock also supports one 5K display at resolutions up to 5120 x 2880 @ 60 Hz, or dual 4K displays @ 60 Hz. Connect all your peripherals and charge your Thunderbolt 3 (USB Type-C) enabled MacBook Pro with a single cable. Glyph's Thunderbolt 3 Dock has up to 40 Gb/s of throughput for data and video, and the ability to daisy-chain up to five additional devices. Glyph's Thunderbolt 3 Dock integrates the power of NVMe SSDs and includes a 500GB NVMe PCIe 3.0 x2 M.2 SSD. With speeds up to 1500 MB/s, you can increase capacity without sacrificing performance. Preformatted HFS+ with Journaling, this is compatible with Time Machine right out of the box. A simple reformat is all it takes to work with Windows systems. Box Dimensions (LxWxH) 11.9 x 6.2 x 3.9"